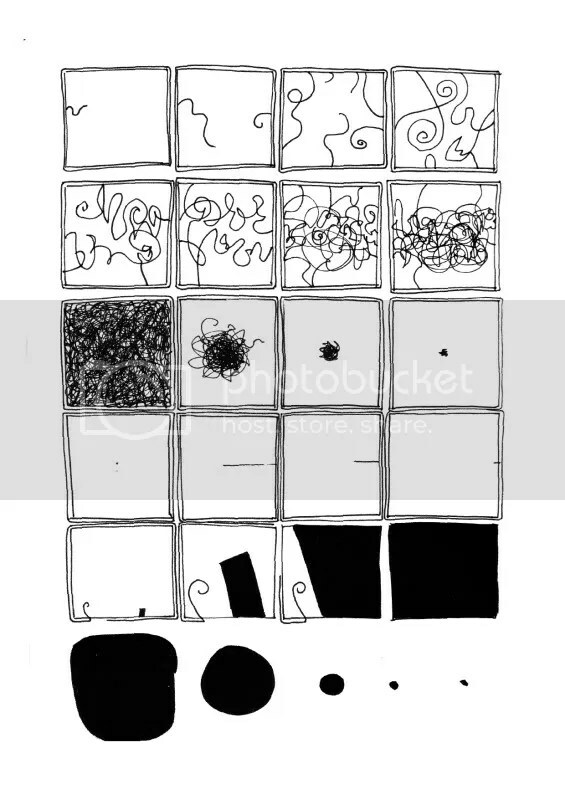 Last week I offered a principle of closure specific to abstract comics: they don’t have any. When you look at a sequence of abstract images, you see the complete story, with nothing left to infer. No closure. So I just contradicted the first half of my first rule of abstract plots: the first image is always balance. So in addition to violating the first half of my first rule of abstract plots, I just violated the second half too. This abstract comic doesn’t begin or end with an image of balance. But I think these abstract comics actually support my argument. Each example of inferred plot points occurs because I experience representational qualities in the not-entirely-abstract images. Because “Blot” ceased to exist at the end of its story, I retroactively inferred that it must also not have existed prior to the first image. The first image is now its birth–a state that necessarily implies a pre-birth state. I’m understanding “Blot” to exist (and to have once not existed) in a sense not constrained to the world of its physical canvas but as part of a conceptual story world beyond it. While I experienced story-world time in the first comic, in the second I experienced both time and story-world space. Those string-like lines, while literally two-dimensional, evoke a three-dimensional world. Otherwise I couldn’t perceive the ball of strings as vanishing into the distance–it would instead be shrinking. The third comic implies not only time and space, but also gravity and physics. The abstract object is an object, one abstract in shape but that exists three dimensionally as it extends downward, and the grass-like lines begin at rest before flying up to it through some kind of magnetic-like attraction. The story ends on a kind of cliffhanger (imbalance) because the trajectory of drawn action implies to me greater interaction yet to come. None of that is “abstract.” All of my inferences, all of the closure I perceived, comes from my applying norms of my world to the world of the images–which is no longer just the canvas. All of the above abstract comics have story worlds. And a story world is where the imagined but undrawn events experienced through closure take place. So abstract and representational aren’t cleanly divided categories. They’re opposite poles on a spectrum. And a more precise term for that spectrum is mimesis, or real-world imitation. “Blot” is clearly not of our world, but its world is like our world to the degree that time passes there and objects like “Blot” exist only for a certain duration. 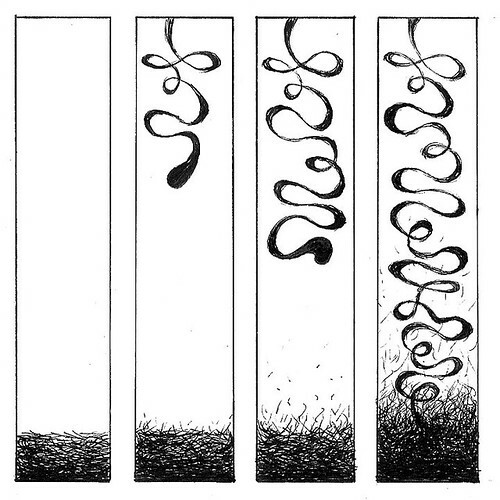 Though the ink marks that represent the string-like characters in the second comic are two-dimensional, their world is seemingly three-dimensional. And the story world of the third comic even evokes our familiar laws of physics. Non-mimetic images don’t produce it.